The rioting and looting that occurred in London this summer has attracted worldwide media attention. Decision makers seem unable to understand the sudden and almost spontaneous outbreak of property destruction and theft carried out by large groups of people that have gripped several British cities. Over the past 2 years, a segment of British youth began committing random assaults aboard city transport buses, then posting recordings of the assaults on the Internet. Similar events have recently occurred in several cities across the USA involving large groups of mainly African-American youths committing random assaults and robberies. Security video technology has shown them entering stores in shopping districts in the eastern USA and literally emptying store shelves of merchandise before leaving en masse without paying. Seemingly organized groups of them have randomly attacked, assaulted and robbed citizens in Chicago during daylight hours in the presence of witnesses, including on city buses. Groups of mainly white Americans were leaving a state fair in Wisconsin when they were subject to random attack and robbery by a seemingly organized mob of African-American youth. The people in London who have been assaulted, robbed, burnt out of their homes and whose property has been vandalized by the roving mobs are at a loss to understand why such events have occurred. Most of them have been left to rebuild their lives using their own resources. The overwhelming majority of political decision makers are also at a loss to explain the meaning and cause of these events. 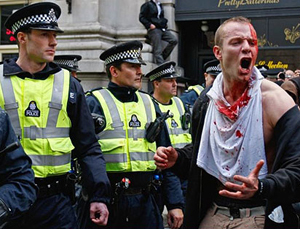 The London riots evolved from peaceful protests against a police shooting of a suspected gang leader. The recent lootings in Toronto during a G20 summit also evolved from a peaceful protest while the lootings in Vancouver evolved from a peaceful mass gathering that followed a hockey match. Riots have previously erupted on to the streets of several cities internationally following soccer matches and other team sports encounters where fans were upset by the final result. It is theoretically possible that the presence of a large peaceful gathering may merely provide a trigger and launching pad for other groups of people to engage in destructive behaviour. French theorist Alexis de Tocqueville offered a theory to explain the cause of the French Revolution in his treatise, L’Ancien Régime et la Révolution that may also provide an explanation for more recent events that have involved looting and attacks on property. Tocqueville advises that “the French middle class of 1789 were wealthy, able to fulfill any position or employment as the nobility, were almost equal to the nobles and almost as powerful as them. They were almost within reach of being equal, but the regime’s institutions granted privilege to the nobility, preventing the middle class from achieving total equality.” Instead of poverty, it is growing prosperity and near equality that is believed to have bred public discontent against the established institutions. The discontent manifests as envy, an insidious emotion where the aggrieved almost equal person resents the privileges and benefits that the regime’s institutions bestow on the nobility. In his treatise, A Theory of Envy, Dr Helmut Schoek theorizes that the envious person does not want the property or privilege of the nobility for himself or herself; they merely do not want the nobility to enjoy the privilege and its special benefits. Prior to the revolution, the French middle class perceived the state as the obstacle that prevented them from achieving full equality with the nobility. The result was revolution. "The discontent manifests as envy, an insidious emotion where the aggrieved almost equal person resents the privileges and benefits that the regime’s institutions bestow on the nobility." Certain practices of modern governments have created nobility at the expense of a well-qualified middle class of almost equal people and have the potential to breed discontent within a segment of the population. Numerous free-market economists have repeatedly shown that economic regulation ultimately fails over the long term, even though its supporters claim to solve selected problems over the short term. Most western governments still regulate various sectors of the economy, but such practices uplift a segment of the population to the level of the pre-revolution French nobility while preventing a large number of well-qualified non-nobility from entering various regulated fields of business activity and achieving total equality. Several of the identified participants from the recent Vancouver and Toronto lootings were found to be from two-parent, upper-middle class families that were perhaps almost equal in several ways to the economic nobility that employed their professional-level parents. Those who violated property and engaged in looting may have perceived the silence of the large crowd of bystanders who stood back and watched as tacit acknowledgement and validation of such acts. A small number within the large crowd may have even cheered them on. At some deep level, many of the participants in the looting may believe that the system and various institutions impose some form of restrictions on them and others of their socio-economic class. Hence the rioting, looting, and violation and destruction of private property that has occurred in London, Toronto, Montreal, Vancouver, Watts and several other major centers around the world. It is a revolt by a segment of the population against what they perceive as government tyranny. Bureaucrats routinely devise ways by which to reclassify peaceful, mutually consensual exchange as criminal behaviour and restrict the peaceful and productive economic freedom of a segment of the population. New economic regulations can be signed into law by order-in-council and without prior debate before an elected body. It is the system that grants special privilege to some and denies it to others, some of whom have taken it upon themselves to rebel and riot on the streets.